Security consultant David Dunn (Bruce Willis) secretly boasts super-strength and is close to indestructible, and patrols the streets of Philadelphia in a hooded raincoat. When he tracks down serial killer Kevin Wendell Crumb (James McAvoy) – a man with several competing personalities, one of which is a deranged killer known as the Beast with similar powers to Dunn’s – he manages to save four teenage prisoners, but gets captured by the police along with Crumb. 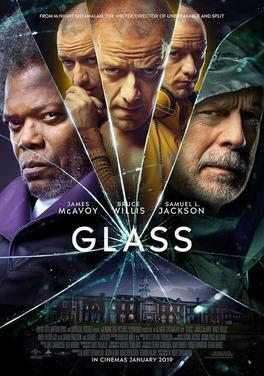 Sent to a psychiatric hospital, Dunn is unwillingly reunited with Elijah Price, aka “Mr Glass” (Samuel L. Jackson); the criminal mastermind who caused Dunn’s powers to exist in the first place. Writer/director M. Night Shyamalan has experienced a pretty bizarre career trajectory over the years. Nobody even remembers his first two features, and assume he started with 1999’s The Sixth Sense. While that film remains a well-deserved modern classic, it is actually his 2000 follow-up Unbreakable that remains my favourite of his films. From there his status in Hollywood seemed to wobble through Signs and The Village before crashing altogether with Lady in the Water. 2015’s The Visit received some praise from critics and audiences, and his 2016 sensationalist thriller Split proved an outright and mainstream smash hit again. It has been a career with dramatic ups and downs, but no one ever quite agrees on which films post-The Sixth Sense were up or down. For me he has always had a certain visual skill in his films, and a distinctive deliberate pace. The Happening is a reasonably solid supernatural thriller in his mid-career that probably needs re-evaluating at some point, but ultimately it is Unbreakable that remains his finest film. It interrogates the comic book superhero narrative through the lens of a supernatural drama. It is the best-ever screen examination of how super-powered vigilantes might affect a real world. Split scored a last-minute twist when it revealed that Kevin Wendell Crumb, aka “the Horde”, lived in the same fictional universe as Unbreakable, and so it is a welcome development to see Glass mash both earlier films into one and give audiences an unexpected movie trilogy – and who doesn’t love a good trilogy? For the most part Glass sees David, Kevin, and Elijah confined to a psychiatrist hospital as the suspiciously sincere Dr Ellie Staple (Sarah Paulson) goes about trying to convince them their powers are imagined and that superheroes cannot exist. Tonally it is something of a surprise: James McAvoy’s deft switches in character from moment to moment injects a lot of comedy, which was in relatively short supply back in Unbreakable. There is also a much more straightforward and naturalistic style to the photography and editing. Unbreakable felt relatively stylised, whereas things in Glass feel much more pragmatic. David and Kevin’s first encounter works remarkably well, and as the film develops it is easy to see the respective films’ continuities meshing together very well. Shyamalan holds back from properly re-introducing Elijah, which makes his proper entrance a particularly enjoyable moment. Both Willis and Jackson return to their old characters in a flawless manner. It is a pleasure to see them again, in the quality of both performances and Shyamalan’s dialogue. Elijah’s secret plans are a surprise, and push the film into a strong and dramatic direction. The film particularly benefits from the addition of two scenes recorded 20 years ago for Unbreakable but cut from the final edit. A flashback to Elijah’s childhood is horrifying, and goes a long way to making the character a sympathetic one despite his murderous actions. The film’s supporting cast are mostly impressive: Anya Taylor-Joy returns from Split as surviving prisoner Casey Cooke, and demonstrates solid growth and character development. Spencer Treat Clark returns as David’s now-adult son Joseph, and negotiates a fairly tricky path in developing his character with aplomb. Charlayne Woodard also returns as Elijah’s doting mother, and struggles somewhat with an underwritten and occasionally unbelievable character. In the third act, the film leaps into what I expect will be a highly divisive direction. New plot elements seemingly appear out of nowhere, and without sufficient foreshadowing or indeed screen time. It is an idea that does have a lot of merit, but it is debatable whether or not it is an idea appropriate to the story already told. It does manage to tie both Unbreakable and Split‘s characters to a conclusion, but it does not feel anywhere as well-developed and directed as the rest of the film. It does not break the film, but it does diminish it. It is difficult to decide precisely what Glass‘ place is in contemporary America. Unbreakable effectively led the 21st century explosion of superhero movies alongside Bryan Singer’s X-Men (released earlier that year). While it did a sensational job of interrogating the tropes, archetypes, and narrative conventions of the genre, that task has been repeated over and over by successive productions. In 2019 I would argue the superhero genre is as well-settled in as the westerns of the 1950s and 1960s. I find myself questioning the relevance of this sequel. It feels like it is answering a question no one is asking any more. Personally I still consider Unbreakable to be a minor masterpiece, and Split an enjoyable pulp horror. Glass is, for the most part, an enjoyable diversion: there’s entertainment value here, but not a great movie. If nothing else it simply makes me keen to watch Unbreakable again.